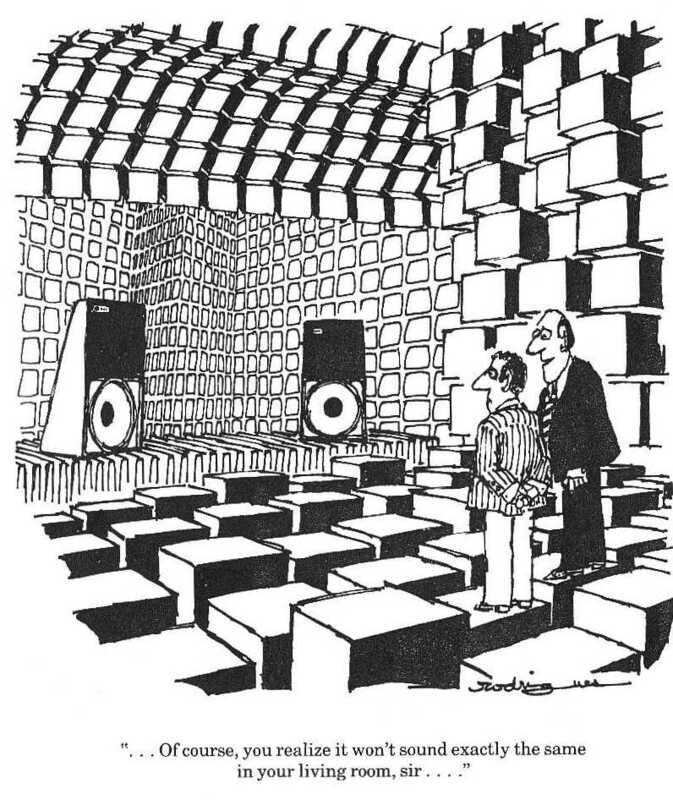 Of course you don’t need an anechoic chamber. Speaker position can minimise the detrimental effects of your listening room. Well, of course it starts with great speakers but, after that, “great” sound is all about speaker position. “Position, position, position.” Where I place speakers within a room has a considerable bearing on the sound of a system. Music – sound – transmits through air, and a listening room encapsulates that air. Speakers act with simple hydraulics: they literally pump air into and out of your ears as the cones push out and in. That’s particularly true for deep bass, but as frequency gets higher and higher, the pump-action gets smaller and smaller. Above 80 hertz – actually, most of the audible range – speakers behave like radio dishes and beam sound toward your ears. And, then, above 3,000 hertz, they change character again to act like floodlights that bathe a room in treble. It makes sense that, if you position speakers carefully in your listening room and tilt them toward you ‘just so’, you can fine-tune them to deliver their best performance. It’s what I try and do with every system here. Well, hopefully, you addressed that dilemma when you purchased yours. There are all kinds of ways you can make a speaker compliment your decor, not quarrel with it. And that’s important because when they’re tuned-in properly, and you’re loving every minute you play music or movies through them, your speakers are going to be a treasured feature of your living room. So often, folks choose their speakers after all the other furniture has been bought and arranged. Too often, speakers are specifically selected to hide into decor whilst large pieces of furniture – coffee tables for instance (all they do is hold your drink!) – sit pride-of-place, as if they’re of some great importance. My approach positions the speakers first and then fits furniture around them to suit your aesthetic appetite. I’m not always popular with fashion police. Well that’s not completely true, we get there in the end. But it’s important to accept that you’re going to see a pair of speakers in the end, and that you’re going to need to to move other furniture to accommodate them; simple as that. The first thing I try to get right is bass. It determines the speaker’s distance from back and side walls. When speakers pressurize a room, sound reflects between all four walls, and forms bands of boomy bass. We want to avoid those bands. I begin with no spikes in a speaker in the corner of the room. It needs to slide easily so I might slip cardboard or carpet underneath to help. I mark the points of an equal-sided triangle with the sofa with masking tape. Then I measure half that distance out to the left and right and mark those points with tape too. I have 3 dots at roughly even spacing (it’s 15% off equilateral, but that’s okay). The 2 outside dots are my speaker positioning targets. Then I play a track with even, repetitive bass. I use “Jennifer Warnes — Ballad of the Runaway Horse” https://youtu.be/5BD7CFwiIsI on repeat. I stand in front of one speaker box and listen to the bass boom from above the speaker. It will be slightly louder on the wall-side than the adjacent side. Slide the speaker away from the corner and the ‘louder’ boom will switch to the adjacent side. Slide the speaker slightly further again and the boom will drop in intensity. That’s the first ‘null’ point. If the first null point is close to my target dot, I stop there. If not, I repeat the process, sliding still further along, to find the second null point. I repeat the process with the other speaker, sliding out from its corner to locate the null point closest to the target. Then I locate the null-points from the back wall. Listen from the side of the speaker, this time, head above the cabinet. The boom will be clearly louder behind the speaker than in front. Slide the speaker forward and the boom switches to the front of the box. Slide the speaker slightly further until the boom drops in loudness and that’s the first null point. If the first null point is close to my target dot, I stop there. If not, I slide further along to the 2nd null point. I finish up this stage with a pair of speakers, somewhat near my target tape parallel to the back wall. I measure the coordinates and remove the sliders. Next, I want to center the sofa. It’s easy with the speakers parallel to the back wall. I sit on the sofa, or chair, at a point between the speakers and look at the speaker cabinets. I move around until I can see exactly the same view of the in-facing walls of the speakers to determine whether the couch needs to move left-or-right by an inch or 2. Then I listen to the bass guitar track again and, ignoring the vocal, I move back-and-forth in the seat until I find a point where the bass is at its clearest. Again it will be within a foot of the original seating position. So I’ve got the bass right. The treble kind of looks after itself. What I want to tune-in last is the midrange. Midrange ‘beams’ out from the driver. It’s loud right in front and soft to the sides. If you think of the shape of a midrange driver – between the dustcap and the cone, it’s a bit like a megaphone. It transmits sound ‘straight out the front’. Jennifer Warnes’ voice, in ‘Ballad Of The Runaway Horse,’ is perfect for this test. I mark the inside, front, bottom corner of the speaker cabinet with a texta dot on masking tape so I can find it later. And I lay 10cm strips of masking tape beside the outside corners with six dots marked at 1cm intervals on each. I play ‘Ballad Of The Runaway Horse,’ and listen for the clarity. Jennifer Warnes’ voice is, more or less, polyphonic. She has a clear head-voice, throat and chest-voice. With speakers set parallel to the back wall, I should hear a clear head-voice but little throat or chest. I move both speakers’ outside corners to the first dot and listen for differences. Throatiness will be more present as she forms each word. Second dot in is usually better than the first and third dot, better again – the mid-range opens up and a deeper chesty, breathy quality to Jennifer Warnes’ voice becomes apparent. I know I’ve gone too far – fourth-to-sixth dot – when the sound closes-in and the voice stops ‘singing’ and starts ‘shouting’. Too far sounds like she’s cupped her hands to her mouth. I set the two speakers back to the dot that sounds best. So speakers are spaced from the walls and toed in. The last axis to adjust is ’tilt’. Spikes allow you to tilt a speaker to better align the midrange driver and timing between all two or three drivers. I use found objects – CD covers and such – to mock-up a tilt angle. I play a favourite track (I’ll have had enough Jennifer Warnes by now) and get my son to slowly tilt one speaker back, hinging the rear bottom edge of the cabinet against the floor. If the sound ‘opens-up’, I want to work out how much I need to raise the front edge of the speaker. I add CD cases, brochures, business cards, etc., one at a time, to the front bottom edge to mock-up the best sounding tilt. What I have at this stage should be sounding pretty good. Finalise the speaker position by marking the perimeter of the speaker, on the floor, in masking tape. Then I assemble enough washers to equal the thickness of my cases, cards, etc. and screw the spikes into place, using the washers as spacers on the front spikes. Always use the spikes, if you have them. If the floors are timber or tiles, I use little pads that usually come with the speakers or five cent pieces to protect the floor. The spikes are ‘right’ when there is no rocking between any two diagonally opposite spikes. When all four spikes are sure-footed, tighten the locking nuts using a spanner, shifter or pliers. With the speakers positioned back within their masking-tape ‘chalk lines’, I completely remove all the masking tape for a clean look. What I should have now, is music where each instrument sounds clear and takes on its own ‘voice.’ Each instrument sounds like it’s coming from its own location within a soundscape ‘conjured’ by the two speakers. Bass is clear, tight, fast and integrated perfectly with the midrange. The overall effect should be thoroughly entertaining. I have more tips for centre and rear speakers for surround sound, but that’s a whole other essay.